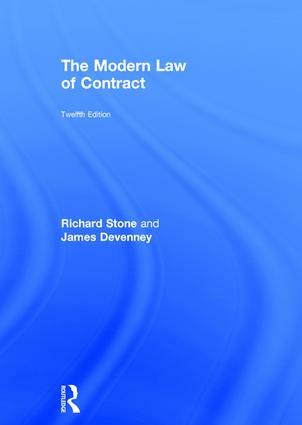 The Modern Law of Contract is a clear and logical textbook, written by an experienced author team with well over 50 years’ teaching and examining experience. ■ consolidate learning and prepare for assessment: further reading lists and comparison website directions at the end of each chapter direct you to additional interactive resources to test and reinforce your knowledge. Clearly written and easy to use, The Modern Law of Contract enables undergraduate students of contract law to fully engage with the topic and gain a profound understanding of this fundamental area. James Devenney is McCann FitzGerald Chair in International Law and Business at the UCD Sutherland School of Law, University College Dublin, Ireland.